On February 8th, the 13th annual Eastern Washington/North Idaho Regional Lakes Conference convened with 120 folks participating. There were quite a few new faces in the audience at the Spokane Community College Student Union and even more familiar ones! WALPA goes to Chelan next fall – save the date! Mark your calendars now for September 30-October 2, 2014! 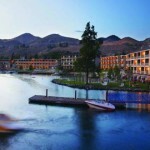 WALPA’s annual conference will be held on those dates in beautiful Chelan, Washington at Campbell’s Resort: http://www.campbellsresort.com/. We have set aside a block of rooms for WALPA members and encourage you to book your rooms soon! Read the next issue of Waterline for more details. Does your chironomids’ dinner give them gas? During the summer, Washington lakes commonly stratify, or separate, into layers of different densities. Throughout summer stratification, warmer waters remain near the surface (epilimnion) and colder waters remain in the bottom (hypolimnion). 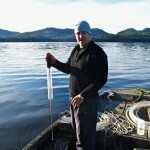 Over time, lakes can accumulate large amounts of organic sediment from both internal lake production and sedimentation from the watershed. As these sediments biodegrade, microorganisms deplete the surrounding dissolved oxygen (DO) supplies in the hypolimnion. Microcystis is a harmful algal bloom that forms cyanobacteria that can produce a potent hepatotoxin known as microcystin. The full range of factors that could affect Microcystis bloom collapse is poorly understood (with the role of virus notably lacking). In addition, our lab has shown that Microcystis strain successions often occur within the span of a single bloom, but the causes for strain decline or turnover are not understood (Bozarth, 2010). 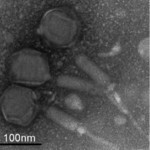 The identification of a Microcystis virus known as Ma-LMM01, which infects Microcystis aeruginosa strain NIES-298, highlights the possibility that viruses may be responsible for some cases of bloom collapse or strain turnover . The Washington State Lake Protection Association is pleased to announce its 2014 competition for student scholarships. 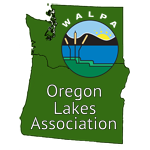 Two scholarships, the Nancy Weller Memorial Scholarship ($1000) and the Dave Lamb Memorial Scholarship ($1000), will be awarded to further our understanding of the limnology, hydrology, ecology, and management or restoration of lakes and watersheds in Washington or Idaho. Students must be part- or full-time undergraduate or graduate students at an accredited college or university in Washington or Idaho. Recipients shall use scholarship funds to cover expenses directly related to their research. WALPA goes to Chelan next fall - save the date! Does your chironomids' dinner give them gas?